Landscapes Styled Like a Dream World You Want to Be In. Richly Colored, Idyllic Places Painted from Travel Sketches. Thus far in my life and my research, I've found that when you're born with talent and an eye for beauty, Art will find its way to you even if you don't pursue it initially. 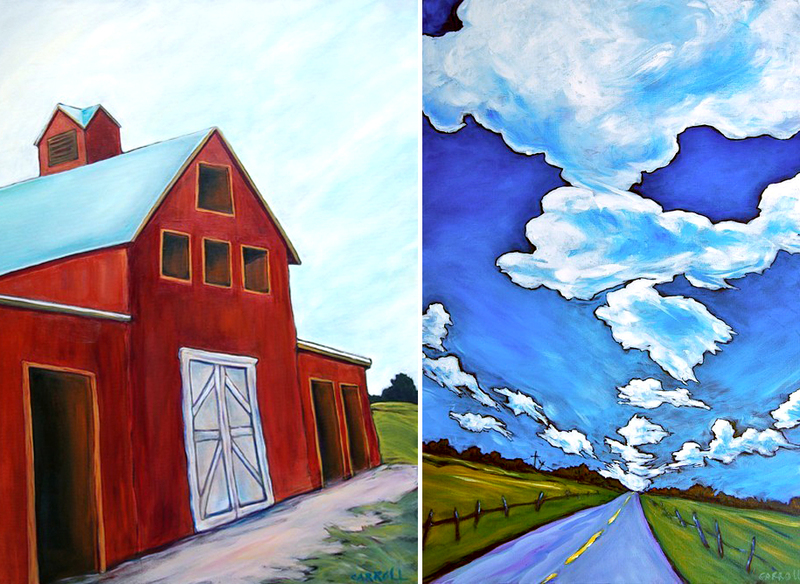 For Austin based painter Debbie Carroll, Art was always an interest, but she started her career in travel as the more "stable" choice. Of course, that only meant she would see more and more things of beauty around the world, so it's no wonder she came back to Art. She found a creative outlet in jewelry making, but it was her passion for painting that best allowed her to share all of the scenes that inspired her throughout many years of travel. While you wouldn't call her work abstract, Debbie has developed a dreamy, stylized look and feel for her pieces. 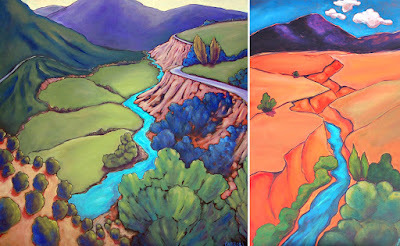 She often uses rich, bigger than life colors that give her work a unique vibrance: purples in a stormy sky, turquoise in flowing rivers, contrasting pink and orange backgrounds for closeup studies. Her goal is to create idealized representation that make her viewers wish they were there. Through her travels, she's collected sketches of sights that move her, from landscapes to architecture to natural elements. She then translates those on to canvas in her characteristic style. 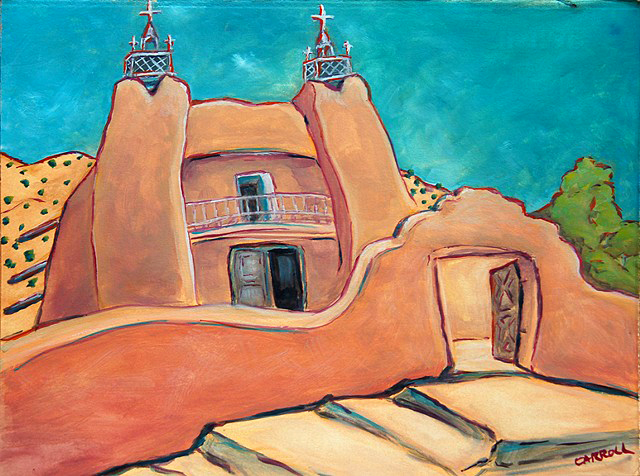 If you've spent any time in the southwest, you'll notice many elements reminiscent of iconic places, but as is Debbie's way, they've been rendered in her vision. She seems particularly drawn to adobe buildings and cactus filled landscapes. In addition to her lively color palette, Debbie also manages to capture a lot of movement with her brush strokes. Just look at how she paints clouds. They're almost pulsing with life which makes it that much easier to imagine yourself in that moment! I may be biased because New Mexico will always have a special place in my heart, but I think we can all agree that Debbie captures truly unique beauty in the scenes, flowers and buildings around her!